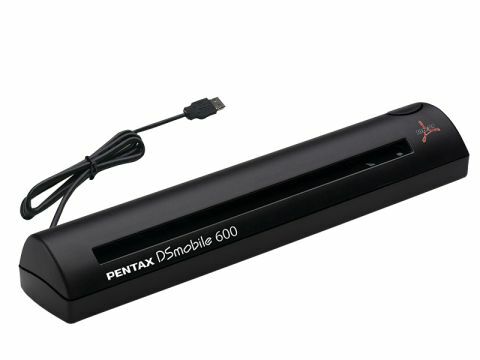 The Pentax DSmobile 600 scanner measures 280 x 51 x 38mm, and is a small and convenient device to carry around. It connects to your laptop using USB, which also powers the device. The driver, along with the supplied DSmobile Scan software that allows you to save scans as PDF files, come on a single CD. This makes the Pentax DSmobile 600 a breeze to set up. There is also the more powerful PageManager 7 for editing your scans to a variety of formats. To scan, insert your page and press the button, which feeds it through the sensor. With a maximum scan area of 216 x 356mm, you can scan up to A4. Scan times vary, with an A4 text page taking 20 seconds, while a full-coloured one took close to 90 seconds. Overall, the Pentax DSmobile 600 produced scans that were smooth with little sign of jagging.